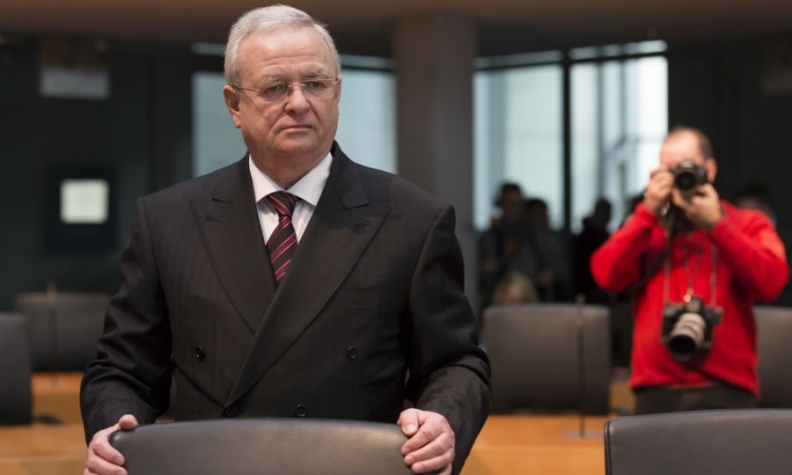 Winterkorn, pictured appearing before a German parliamentary committee, said: "I too am looking for satisfactory answers." BERLIN -- Former Volkswagen Group CEO Martin Winterkorn told German lawmakers he did not know about the company's systematic emissions cheating earlier than VW has officially admitted. VW has said its executive board did not learn of the violations until late August 2015 and formally reported the cheating to authorities in the U.S. in early September that year. Asked whether he had known about software cheating earlier, Winterkorn told the German parliament's committee of inquiry into carmakers' emissions irregularities on Thursday: "That is not the case." "I too am looking for satisfactory answers," Winterkorn said his first public remarks since he apologized for the scandal in September, 2015, four days after news of the manipulations broke in the U.S.
Winterkorn said he wasn’t directly involved in complying with emissions regulations and declined to say when he first learned of the cheating, citing an ongoing criminal probe. "What happened makes people furious -- me too," said Winterkorn, 69, who was wearing a dark gray suit and striped burgundy tie. "I am deeply upset that we disappointed millions of our customers. For that I apologize." Winterkorn was flanked by his two lawyers who allowed him to address all questions. Winterkorn portrayed himself as an upright, quality-focused executive who maintained an open-door policy and was receptive to criticism. More than a year after the scandal burst into the public, senior management’s involvement in the cheating remains unclear. Winterkorn defended himself by claiming he is no software engineer and that the rogue acts didn’t rise to his level. Still, his claim that he was unaware of technology installed in 11 million cars worldwide to deceive emissions testers contrasts with his reputation as a detail-obsessed executive who was known for upbraiding VW employees for even minor design flaws. "Everyone who knows me knows that I have always placed great value on quality," he said. "From the outside it's difficult to understand how something like this could happen at a company that is so focused on quality. Even I don't." "It’s incomprehensible why I wasn’t informed early and clearly,” Winterkorn said. "I would have prevented any type of deception or misleading of authorities." An engineer who rose through the ranks at Volkswagen and built it into the world’s biggest carmaker, Winterkorn has seen his legacy tarnished by a scandal that’s cost the company 20.5 billion euros ($21.9 billion) so far and led to the indictment in the U.S. of six senior executives. Investors may be closely watching the Winterkorn testimony for any clues as to when he found out about the manipulations. VW is facing 8.8 billion euros ($9.36 billion) in damage claims from investors seeking compensation for the collapse of VW's share price after the scandal broke. There are indications that Winterkorn may have missed warning signs before the crisis erupted. VW said in a court filing last year that Winterkorn received two memos informing him of discrepancies in U.S. diesel emissions in 2014 and participated in a meeting in July 2015 that touched on the matter. On being asked whether he thought the diesel cheating could still be blamed on just a few engineers, Winterkorn acknowledged that it was more than a handful of staffers who knew but said he did not know how many people were involved. Earlier this month, VW admitted to U.S. prosecutors that about 40 employees had deleted thousands of documents in an effort to hide systematic emissions cheating from regulators. Asked why he himself had no earlier knowledge, Winterkorn said: "Software applications represent a very specific area of work in engine development." Winterkorn has not appeared in public since VW released an awkward filmed apology from him on Sept. 22, 2015. In the video, a visibly shaken Winterkorn looked anxiously into the camera and read a statement saying that he was "endlessly sorry." He resigned a day later.